Two young scientists, Clive and Elsa work at N.E.R.D. on splicing animal DNA to produce living entities that will hopefully help humanity. They balk when the company pulls the plug on their project when they believe it should be taken to the next level of mixing human DNA in the experiment. They go against their corporate employers by secretly continuing their tests in an storage room at the facility. After many false starts, they finally get one combination of genes to incubate. Adrian Brody and Sarah Polley portray the brainy couple who are mavericks in their field. They don’t seem to be following any standard scientific protocols by operating without backup or controls. They hide the quickly growing embryo while they go home and argue the righteousness of their actions. Elsa claims she just wants to see if it would work and they would quickly destroy the result. However, she just as quickly becomes imprinted when the creature births before they expected. Wide set eyes, a bird like body and legs; it eventually grows 4 fingered hands and arms, looking more human in its features. She does not speak as much as trill, but she is able to think and reason with an animal instinct and imperative. Elsa and Clive fluctuate from treating it like a child and an experiment, naming her Dren (which is NERD backwards, duh). Clive’s brother who is working on the original experiment tries to tell Clive of some anomalies that he’s discovered but Clive is too involved and worried about the ethical questions of what’s going on in the secret lab. As mutant young womanlike creature Dren(Delphine Chanéac) it makes it harder to hide at the lab especially when Clive’s brother discovers what they are doing. They move her to Elsa’s mother’s abandoned farmhouse where they ensconce Dren in the barn. She undergoes some unexpected metamorphosis that put the scientists in an increasing dangerous situation. 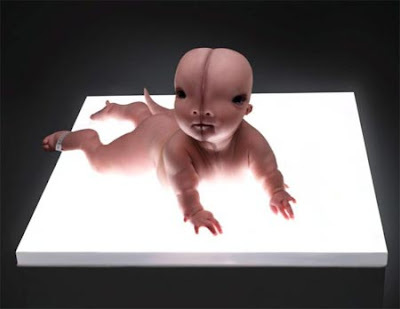 Splice was written and directed by Vincenzo Natali (Cube) and screenwriters Doug Taylor and Antoinette Terry Bryant. Natali had worked on this story for the past 15 years after seeing a story about a mouse growing a human ear on its body. The film is not exactly horror although there are some blood and guts scenes. It’s more scifi with nods to Alien, Mimic and Jurassic Park. Brody and Polley do a good job with their difficult characters that are hard to believe as scientists because of the improbable leaps of judgment that may work to propel the story but grates on believability. The ending offers a possibility of sequel that would probably more interesting than the first.